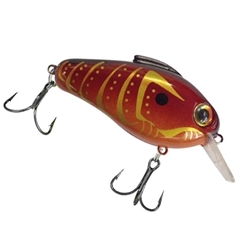 The Bill Lewis Echo 1.75 widens a fisherman's strike-range. It allows anglers to cover water faster and catch more fish. With the balance of a low-knock and a high-rattle, the Echo produces sounds that reverberate through the water, hitting the fish's inner-ear at a distance. It will cast further and thump harder than most cranks. The 1.75 size puts the Echo in a class of its own. Be sure to know the Echo is only Made in the USA with quality parts.